Rubber scrapers, mixer, cookie sheets, bowls? These are just some things I can’t live with out! Today, I brought my camera into the kitchen for a different reason… I wanted to show you the things I use everyday… the essentials to making my baking experience smooth, easy and fun! So come take a look behind the blog and explore my kitchen favorites! 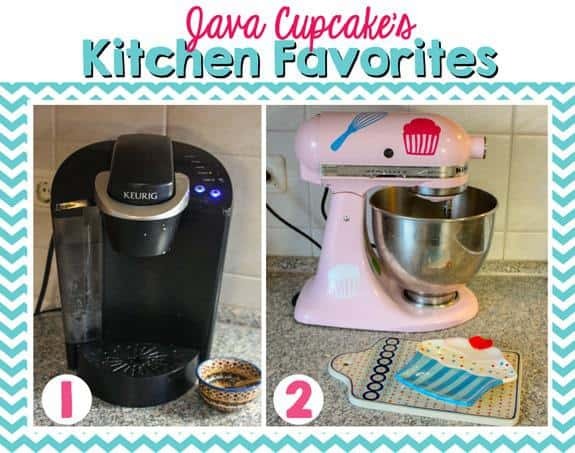 1) Keurig Single Cup Coffee Maker – I can not live without my coffee maker. Not only do I use it for my morning cup of joe, but it’s so useful when it comes to baking. Only making a small amount of coffee at a time, I don’t have to brew and waste an entire pot just for one batch of cupcakes! LOVE IT! 2) KitchenAid – This is probably the most favorite thing my husband has ever bought for me. (Well, besides my wedding ring!) I have gotten so much use out of this stand mixer, that I’m contemplating buying a second. 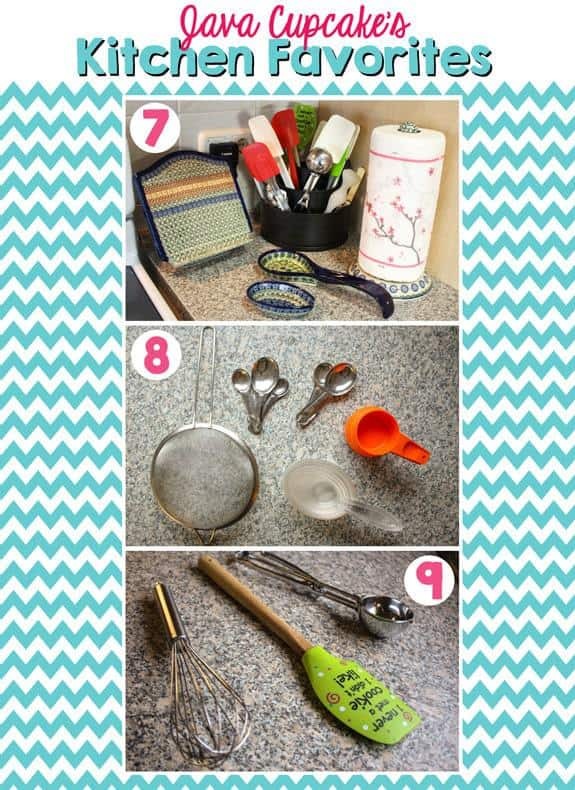 2) Spoon plates – I use the cupcake plate and Polish Pottery cutting board next to my stand mixer to hold spoons, spatulas, whisks so they counters don’t get super dirty. These are really essential tools to keeping the counters clean while I’m prepping batters and dough! 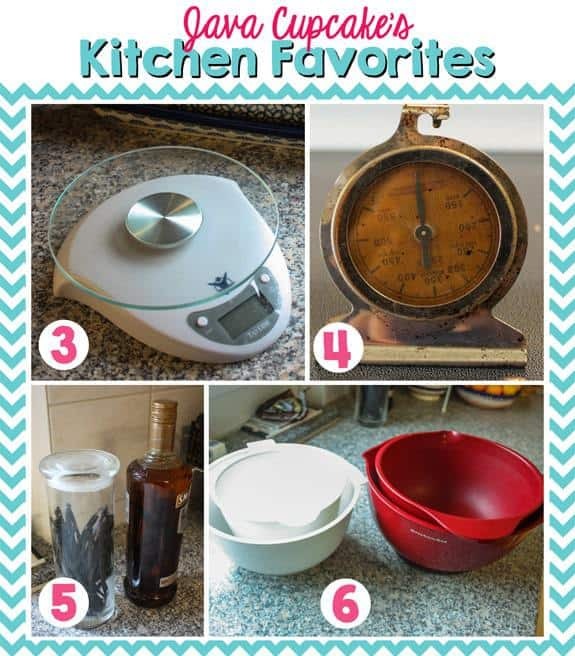 3) Kitchen scale – Since moving to Germany, a lot of recipes I use are in ounces and grams… having a kitchen scale is essential to measuring out flour, eggs and all kinds of ingredients for baking. I haven’t actually bought one myself yet – I stole this one from my neighbor. But, it’s on my list of things to order ASAP! 4) Oven thermometer – This thermometer was actually in my Grandmother’s oven… that’s why it’s upside down and a worn in color. Making sure my oven is the correct temperature before baking is something I do before I put any cupcake, cake, bread or roll in the oven… every time. Always! 5) Homemade Vanilla Extract & fresh Vanilla Beans – Because I bake so much, I find it super helpful to just make my own vanilla. One big bottle of vodka, 8-10 beans and 2 months. This bottle will last me about 3-5 months and is so much less expensive than buying the extract in small bottles. I use vanilla in almost everything… beans too. So having a big supply of fresh vanilla beans in an air tight container, on hand and ready to use, is super essential. I usually get my beans from Beanilla. 6) Mixing bowls – Several sets of mixing bowls makes preparing batters and doughs so much easier when a stand mixer isn’t required. Especially several different bowl sizes and multiples of the same size. Just having options is really the key to mixing bowls. 7) Cookbook stand – I got this cookbook stand in Poland and I love it. Granted, most of the time I put a tablet or my phone on it instead of a cookbook, it really comes in handy while baking from a new recipe! 7) Tool caddy – This one is from Pampered Chef and I love it. LOTS of places to put spoons, scrapers and tools that I use on the regular. Having these tools just a short reach away is super helpful. 7) More spoon holders – I’ve got another set of spoon trays by the stove so I can have a place to set spoons when I’m using the stove. Keeping my counter clean is a big priority! 7) Paper towels – I like pretty paper towels. I typically never buy plain ones and they always live on this Polish Pottery stand. I go thru at least half a dozen paper towels each time I bake. Cleaning as I go… it’s a must! 8) Mesh sifter – I like using this mesh sifter more than the old school flour sifter when combining dry ingredients. I find I can fit more into it at once and it’s actually super easy to use. It’s a must have in my kitchen. 8) Measuring spoons & cups – I’ve had my fair share of fancy measuring spoons, but to be honest – I go back to these metal ones every time. These came from my Grandmother’s kitchen (I got a lot of stuff from there) along with the old school orange measuring cups. I think I actually have 4 sets of measuring cups. The more the merrrier… sometimes a recipe calls for 1/2 cup of 4 different things. So it’s good to have several of the same size. 9) Ice Cream Scoop – I use this every time I scoop batter into cupcake liners. The ice cream scoop ensures equal amounts of batter into each cup and it makes control of the batter so easy! 9) Rubber Scraper – I have about 10 different rubber scrapers, but this green one is my favorite. I like the shape of the head and the strong, wood handle. It’s sturdy and scrapes the bowl really well. LOVE this one! 9) Wire whisk with medal handle – I’ve gone through several whisks and this is my favorite. I got it at the Euro store for €2 – cheapest one I’ve ever bought – but it’s the sturdiest and my favorite. I’m pretty sure the next time I’m at that store, I’ll buy more. What makes you a success in your kitchen? What are the tools that you use every time you bake that really are essential to making things easy? What are the things you can’t live with out? What are your kitchen favorites? Love this post, love to see what an experienced baker like you relies upon!